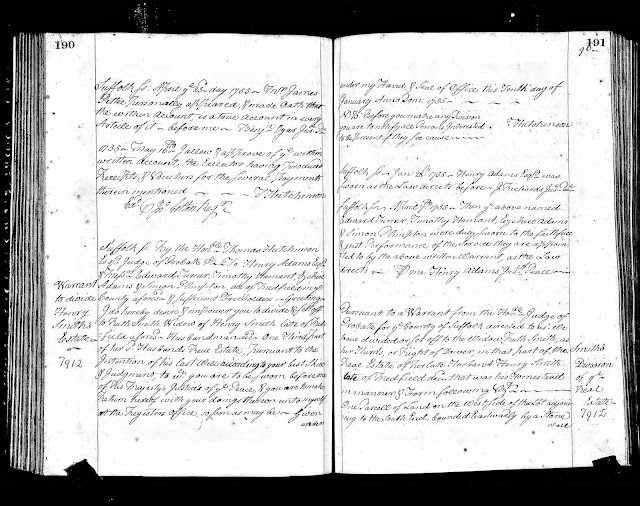 Genea-Musings: Amanuensis Monday - Post 323: Widow's Dower Division for Estate of Henry Smith (1680-1743) of Medfield, Mass. Amanuensis Monday - Post 323: Widow's Dower Division for Estate of Henry Smith (1680-1743) of Medfield, Mass. County afors^d & Sufficient Freeholders – Greetings. to be present if they See cause. Sworn as the Law directs before J Richards Just^e Pea^ce. directs. ?? me Henry Adams Jus^c of Peace. in manner & Form following Viz^t. off Dung. - Medfield May 7^th 1755.
ingly. Boston May 19^th 1755. 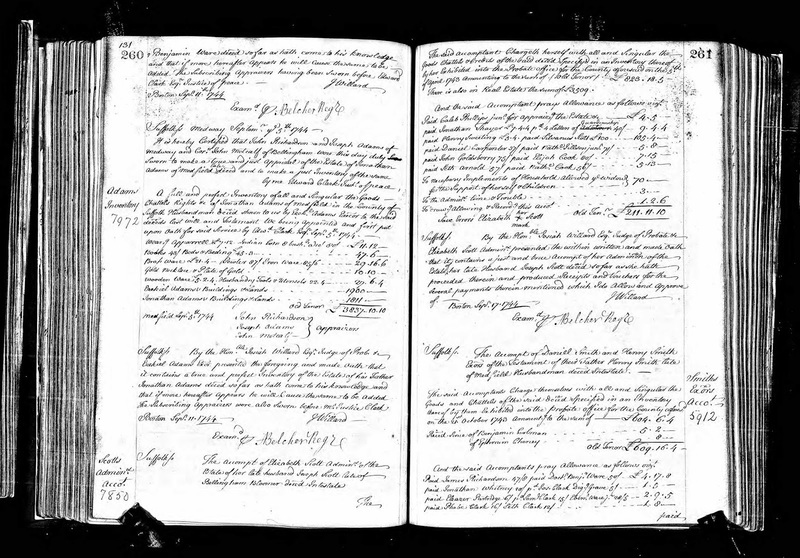 Massachusetts, Wills and Probate Records, 1635-1991, indexed database with digital images,Ancestry.com (http://www.ancestry.com), Suffolk County, "Probate Records, Vol 50-51, 1755-1757," Volume 50, Pages 190-193 (images 106-107 of 825), Henry Smith widow's dower warrant and division, 1755. There are two records here - the warrant that orders the division of the widow's dower, which appoints the subscribers, and the actual division of the real estate which is then approved by the Judge of the Probate Court. There is no indication of the acreage, or length of the bounds, for the land set off for the widow. The family members, and the subscribers, were familiar with the real estate involved, and were probably satisfied with the division of the land. The subscribers were probably associates or neighbors that the family trusted. Now I'm wondering if there is a probate record for Ruth Smith - was this real estate owned by her, or just kept by her and then divided by her heirs when she died. The will of Henry Smith says that they are hers to have during her natural life. 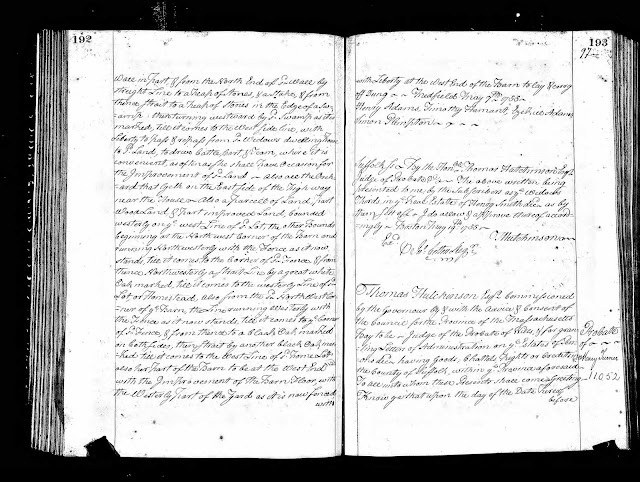 See Amanuensis Monday - Post 320: Will of Henry Smith (1680-1743) of Medfield, Mass., Amanuensis Monday - Post 321: Estate Inventory of Henry Smith (1680-1743) of Medfield, Mass., and Amanuensis Monday - Post 322: Account for Estate of Henry Smith (1680-1743) of Medfield, Mass. for earlier blog posts for the probate records of Henry Smith. I had been searching & searching for my sister's birth certificate and another family member for a long time. Both had been born about a year and a half from each other in 1921 and 1922 in Indianapolis, Marion, Indiana. I had tried many different spellings for each person but no matches. Finally, I tried again after seeing the updated records on your site on June 6. This time I tried a different tactic. I had the birth dates for each person and only put that in the search box along with Indianapolis, Indiana. A list of many people came up for those dates. Voila! Success! I found both records that day listed with incorrect names which of course why I was unable to find them originally. I was able to send news of the discovery of her grandfather's birth record to a distant cousin in France I found this year. Thanks again for posting your updates from ancestry and family search.